Nowadays, CHINAPLAS has become an international event. The demand for recycling solutions is also growing in every part of the world. “We meet a lot of customers, not only from China, but also from Bangladesh, India, Mexico, etc.” said NGR CEO Josef Hochreiter. Despite a risen awareness for environmental protection, last year was tough for the recycling industry due to the low crude oil price and hence cheaper virgin materials. “First of all, the crude oil price has gone up a bit. More importantly, I can see that the recycling industry will be less influenced by the oil and virgin material price, because recycling is a necessity for the good of the planets. We are on the way.” observed Hochreiter. 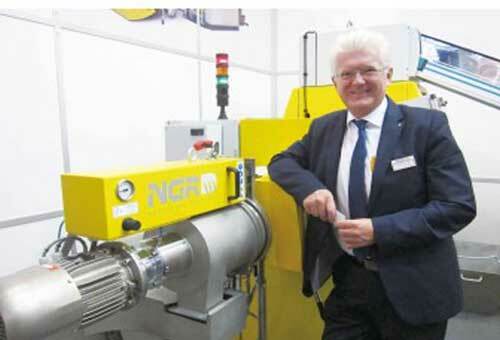 NGR has appointed Wolfgang Stanek as new CEO of its Taicang, China subsidiary in the beginning of this year. Its Chinese subsidiary, Taicang Next Generation Recyclingmachines Co. Ltd. currently has five employees in total. “I think we have the right setup to explore the Chinese market,” he said. The plan is to intensity sales activities “because we have the possibility now to demonstrate to customers what we can do”. NGR’s Liquid State Polycondenzation (LSP) process for polyethylene terephthalate (PET) recycling, he said, has drew a lot of interests in China. “We have sold five machines of such kind globally, and I am convinced the first one will be sold in China within these months,” Hochreiter said.